Last May, we met the dynamic duo of Dot Dash Design at the New York Stationery Show. Like I said previously, we were immediately drawn to their beautiful designs and presentation. Okay, I seriously made a beeline to their booth! Lucky us, they were as delightful as they were professional! 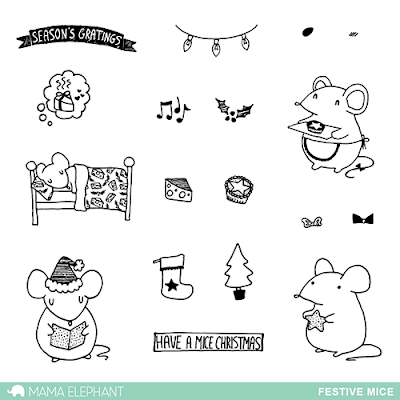 We fell in love with their naughty mice and asked them if they would design some holiday mice for us... and here we are! They did a brilliant job with Festive Mice down to the punny sentiments! I made a cute little scene looking through our new Window Watching Creative Cuts die set! There are optional shutters I can use, but I opted not to here. 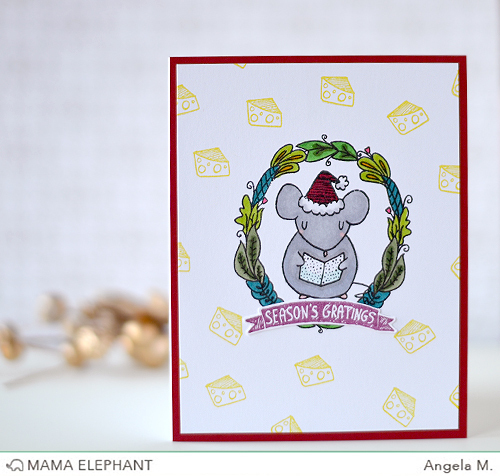 In this scene, we are taking a peek inside the holiday home of this cute little mouse decorating his tiny tree with a star made out of cheese! LOL! The snow splatter on the outside makes this scene even warmer as we imagine the little mouse must be all warm and toasty inside. The window definitely evokes that warm and cozy feel for the scene inside!! Here's a better look, the Window Watching Creative Cuts die comes with a 16 panel window, an awning (folds out to create a 3d effect), a planter (folds out to create a 3d effect) and one shutter (you cut twice to create double shutters). You'll love all the little details in this design! Angela used a caroling mouse as the focal point wrapped in a wreath from Charmed. Don't you love the cheesy background she created? Aww the mouse laying in bed killed me!!! I love him!!! This is the cutest set!!! Love this set. Cute the way the scene was worked behind the window. Ohhhhhhhhhh! I couldn´t choose just one of the new products!!!!!!!! I wish real mice were that cute!! Very cute, both cards are adorable! These Lille Christmas mice are just amazing. I love the one sleeping in bed and airing for Santa. Oh this stamp set is soo cute! Really cute cards! This is such a darling stamp set and I am 'Over the Moon' with the new Window Watching Creative Cuts die set! Both are going right onto my wishlist!